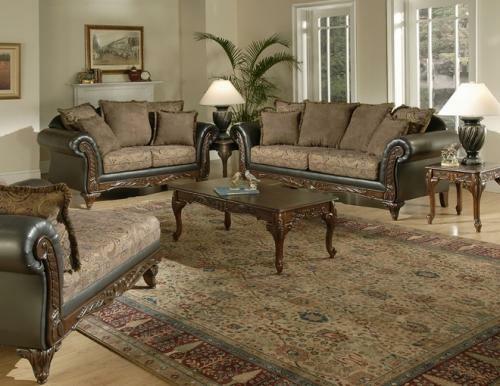 The fine lines and flowing beauty of the are just the beginning of the craftsmanship found in the traditional design of the Silas Raisin Living Room Group. Coordinating the Chaise, Loveseat and Sofa is the acanthus leaf carving and cabriole claw feet found on each piece, in a rich dark finish. 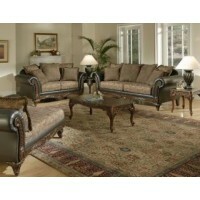 Flowing lines, padded armrests and comfortably padded seat cushions upholstered in durable versatile fabric in a traditional paisley pattern, with a faux leather and chocolate polyester suede on the arms . Coordinating pillows accent the inviting atmosphere created by the Silas Raisin Living Room Group, and it will transform your living area into a beautiful, warm haven.